After murdering his wife following the discovery of her affair, Takuro Yamashita (Koji Yakusho) hands himself into the police. Eight years later he is released from jail on probation, with a monk and his wife agreeing to be his person of contact. Yamashita starts on his journey to rebuild his life, setting up a barber shop. He has a pet eel, that he was allowed to keep in the jail and whom is the only creature he feels able to confide in. Despite attempts to stay out of trouble, he soon bumps into Keiko Hattori (Misa Shimizu) who has attempted to end her life. She is also trying to escape from her past and joins Yamashita as assistant at his barber shop. Yamashita is also surrounded by a selection of other unusual characters, fellow ex-convicts, flashy businessmen, and a young man who is attempting to communicate with UFOs. “The Eel” opens with a shocking murder. Yamashita finds his wife engaged with her lover and the bloody slaying is a startling sequence that intentionally provokes strong feelings. What follows is a strikingly tame drama,as we watch Yamashita, now released from jail come to terms with what he has done. 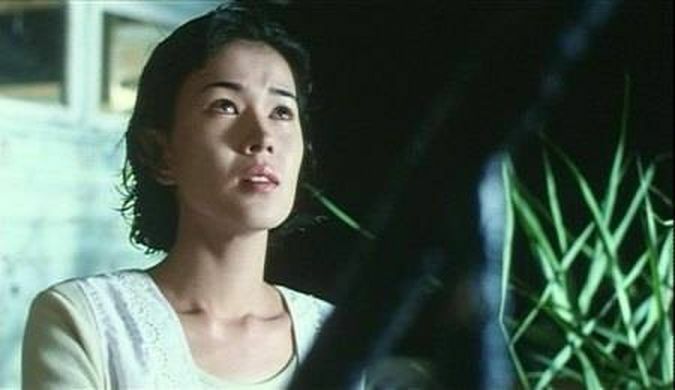 The story is based on a novel by Akira Yoshimura with a screenplay by Daisuke Tengan, Motofumi Tomikawa, and director Shohei Imamura. Imamura gives us a warts-and-all portrait of Japan, with untidy streets and run-down buildings. This clear-eyed worldview continues in his portrayal of the characters. Takuro Yamashita and Keiko Hattori are both flawed individuals, having made bad decisions, however understandable, and the film underscores both positive and negative aspects of humanity. The film includes a number of more off-beat moments, such as the character hoping to attract UFOs, that add an unusual flavour to the foreground crime drama. The score by Shinichiro Ikebe is a great compliment to the drama, an oddly lilting tune that plays throughout,sometimes as a sinister dirge, at other times a more darkly comic riff. This is in keeping with the film itself that balances the brutal realism of the opening, with exquisitely shot sequences of characters drifting down stream in the early morning, and also with the more mundane every day sequences of work.It is a world that is full of contradictions and populated with brilliant performances by the main cast and great supporting roles including Tomorowo Taguchi and Show Aikawa. “The Eel” deals with trust, jealousy, forgiveness, regret and redemption. Following the explosive opening sequences the plot settles down into a contemplative mood and we are brought along with Yamashita as he tries to piece together his life following his sentence. The normalcy of his life post-release sits in stark contrast to the murder and begs the question of whether it is possible to fully move on from such a crime. The film also has the feel of a modern fable, with the eel being representative of Yamashita,first in being trapped in its tank, and later in the peculiar life-cycle coming to represent his own situation.